Apartment Carol 2 is new fully refurbished apartment in our family house with the swimming pool. It is nicley decorated, modern and fully equipped. It is ideal for families with children or for couples or friends. It accommodates up to 5 people- four in the two bedroomsand one on the sofa in the living room. Kitchen utensils- fridge, freezer, two ring stove, oven, dishwasher, microwave, kettle, toaster and coffee maker, dishes and cutlery. Washing machine is in the apartment. There are two bathrooms in the apartment- one is with shower, wash basin and toilet, and other is with wash basin and toilet. Two private outdoor balconies- one with the seaview and other with hill view, both with table and chairs. This apartment is located on the first floor with 15 stairs to it. Apartments Carol are located in the picturesque town of Cavtat, 17km (10,54 miles) south from Dubrovnik and 3 km (1,8 miles) from Dubrovnik Airport. Surrounded with colorful Mediterranean vegetation and exceptionally clean and blue sea, this beautiful small town has become one of the most attractive tourist destinations along the Dalmatian coast. Dubrovnik is 25 minutes by bus/car or 45 minutes by boat. 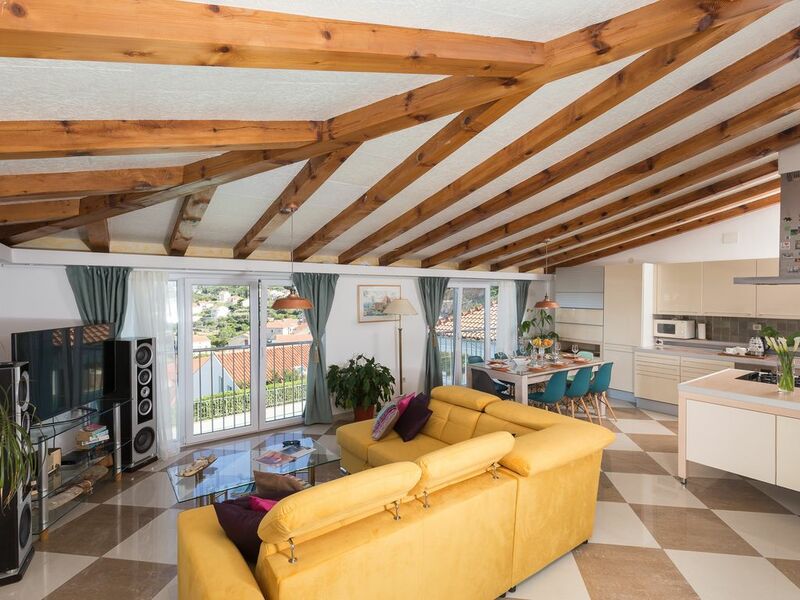 This high quality brand new apartment offers stunning views across the Adriatic Sea towards Dubrovnik against the outstanding backdrop of the Dalmatian mountains. We are family Bendiš- Carol, Ivo and Božo. We were born and raised in this house and we love when people feel welcomed at our place. Most of the time you will interact with Carol, a young lady who will be at your service to help you during your stay at our house. We have a year long experience with renting our hose and the best reward for us is when people come at our place again. Our place is ideal because it is near the main touristic spots and very good base for exploring the surrounding areas, yet it is in peaceful family houses neighborhood. At our place you will for sure experience one of the most beautiful sunsets in your life- breathtaking sea view over the Cavtat bay and Elafitti islands in the distance, both from the pool area and from the sofa in the living room. Towels, soap, changing every three days. Hair dryer available. There are two private balconies for this apartmen- one is with the seaview and other with hill view- both are suitable to sit and dine on it. Smoking allowed on the balconies. Towels changing every 2- 3 days. Pets considered (small pets only). Firstly I would like to mention how efficient the Bendis family were with the transfers to and from the airport. The apartment was very spacious, spotlessly clean and well equipped. The balcony had enough room for a patio set, where we were able to sit and enjoy the beautiful sunsets over Cavtat Bay. We also had a lovely shaded patio area at the front of the apartment. The pool area was always very clean and there were plenty of sunbeds. There is a very handy supermarket very close to the apartments where you are able to pick-up essentials. As previously mentioned it is quite a walk to Cavtat town, we were offered lifts by the Bendis family, but we chose to walk off the lovely meals we had in the many restaurants in town. We also ate in the apartment restaurant and I have to mention the chef, who prepared fabulous food and was always attentive,courteous and the food was such good value. The Bendis family are very accommodating as Carol's brother kindly took us to Dubrovnik because we had an early morning booking-kayaking which we thoroughly enjoyed. Croatia is a beautiful country (third time we have visited), Cavtat is a very quaint town, we had a fabulous holiday made even more special by our hosts the Bendis family. We will definitely return. My husband, daughter and myself stayed last summer. The apartment, pool and owners couldn't be faulted. The views are spectacular, the owners will take you to and from the town centre to save walking back uphill. Buses to Dubrovnik leave and return to the road end regularly. A large supermarket is less than 5 minutes walk away. We ate in the restaurant once towards the end of the holiday - wish we'd tried it sooner as the food was lovely. No menu as such, just fresh fish and steaks, and a choice of accompanying sauces. I would recommend this - especially for those looking for somewhere picturesque and not too developed. We spent a week in this very spacious, spotlessly clean, very well maintained apartment. The wonderful Kate was there to greet us when we arrived and always on hand if we had any questions. Excellent cutomer service. The view is fantastic from the apartment. The walk down to the water is short but coming back can be testing when the sun is very hot. However lifts from Kate can be easily arranged if needed. I would recommend this property. My Fiance and I went for our 2nd trip to Croatia in September with My Brother and his Partner. We stayed in Apartment 1 and really couldn't have asked for more from our hosts. The Bendis Family were so welcoming, and Kate was always on hand ensuring we had everything we needed (and more!). I would recommend taking up the offer from Kate of traditional Croatian cooking, she makes a gorgeous Peka, and we had a lovely evening meeting with some of the other guests in the apartment block. I would recommend Croatia to anyone and in particular staying with The Bendis Family. Fantastic holiday, our 2 weeks flew by so fast. We had a wonderful stay in apartment 2 which had everything we needed for a group of 3 including a galley kitchen, internet access and air conditioning, The apartment has a fantastic view and although the pool was lovely we really enjoyed the short walk down the hill to a perfect beach - Kate was always on available at the end of her mobile to spare us the steep climb back up! Cavtat and Dubrovnik are great places to explore with plenty to see and do - culture and relaxation in equal measure. Because of its proximity to the airport and the fact that trasfers were both easy and included in the price I would recommend this apartment for a short break as well as a longer holiday. Kate and her family are great hosts, nothing is too much trouble. We would have no hesitation in recommending this apartment to others! We often have some discounts so please, don't hesitate to contact us.